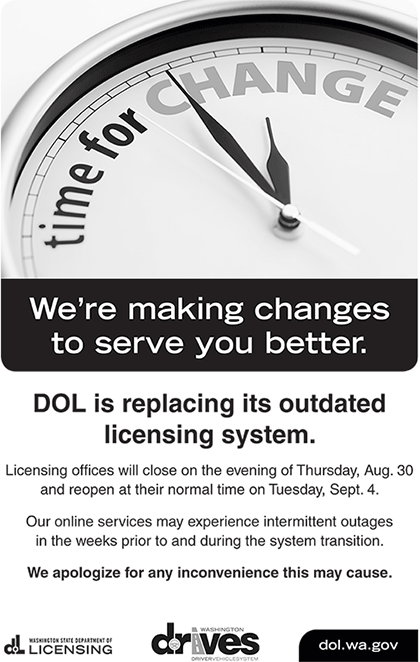 The Department of Licensing’s transition to a new and improved computer system is underway, and all driver licensing offices are closed today through the Labor Day weekend. All vehicle licensing offices will be unable to do vehicle transactions and most online services are unavailable through Monday, September 3. DOL apologizes for any inconvenience these closures may cause and we look forward to serving you better than ever before, thanks to our state’s new, user-friendly computer system for driver and vehicle services. The Washington State Department of Licensing will launch a modernized driver licensing system at the end of August, and customers need to be aware of office closures and the unavailability of online services. The method used to assign a driver license number to each person is changing and the new numbers will better protect everyone’s personal information. Washington driver licenses will now have the prefix “WDL” (Washington Driver License) followed by nine randomly assigned letters and numbers. This is a change from the current driver license numbers in use today which were based on a person’s name and birth date. “We are pleased to provide this additional layer of privacy and security for our customers,” said Berntsen. The change to the new driver license number will start with all Washington driver licenses and ID cards issued on September 4, 2018. Those who already have a driver’s license or ID card will get the new number when they renew or replace it after September 4.